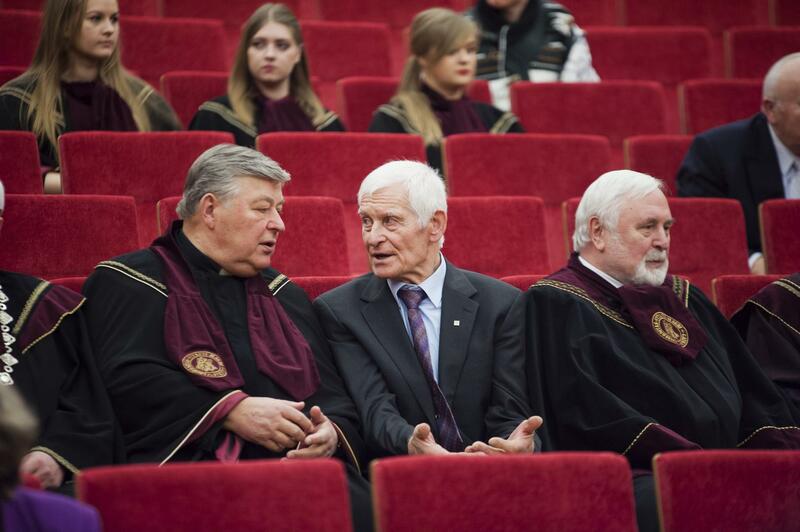 Vytautas Magnus University marked 92nd anniversary since establishment and 25th since revival with a festive event at VMU Great Hall on Friday 14 February. 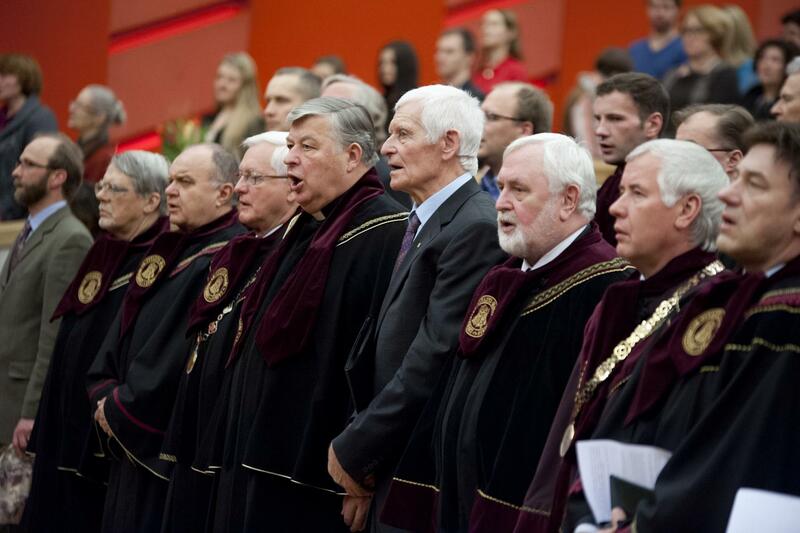 Traditionally, the celebration was also dedicated to the Day of Restoration of Lithuania’s Independence, which is observed on 16 February. 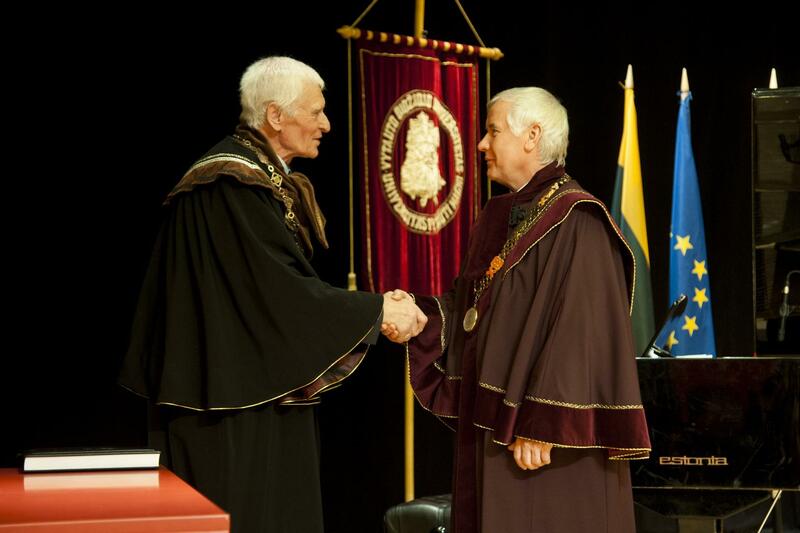 The official date of the university’s establishment falls on the same day: in 1922, the University of Lithuania was founded (renamed to Vytautas Magnus University in 1930) by Lithuanian intellectuals who made it a vitally important breeding ground for cultural, scientific and modern ideas. 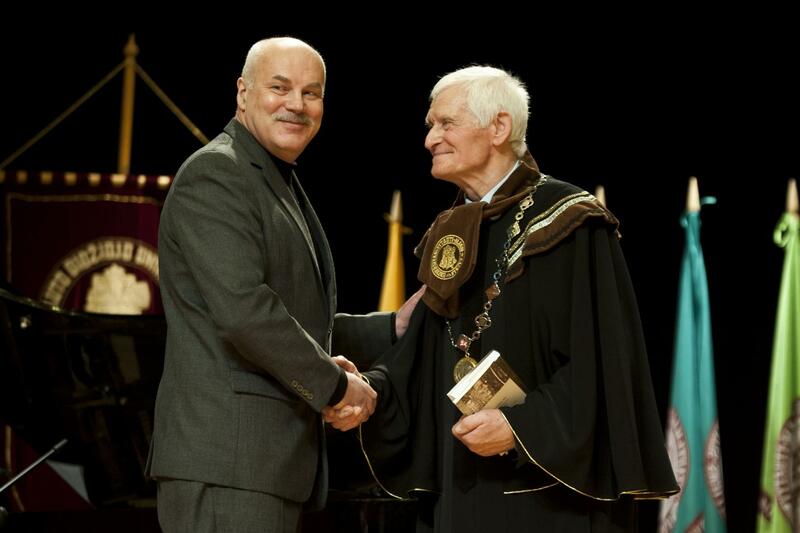 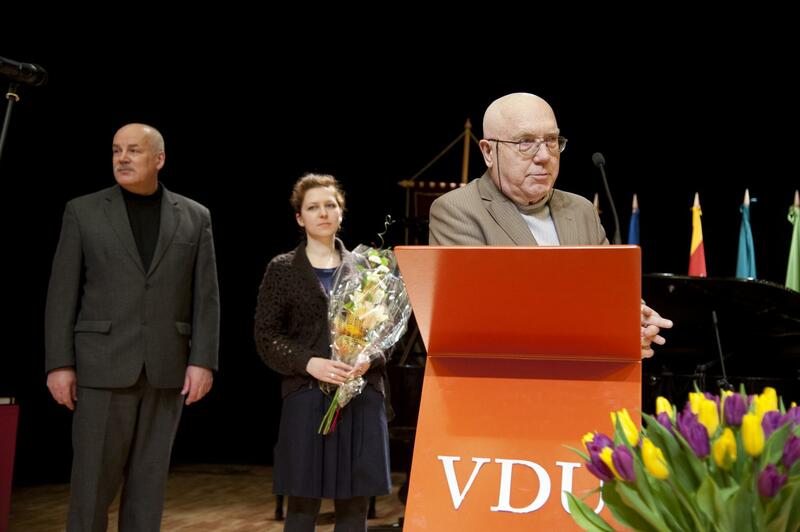 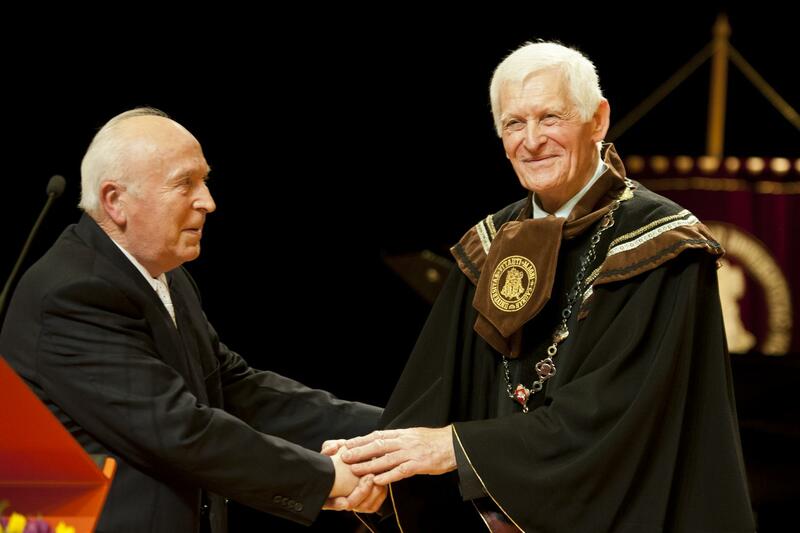 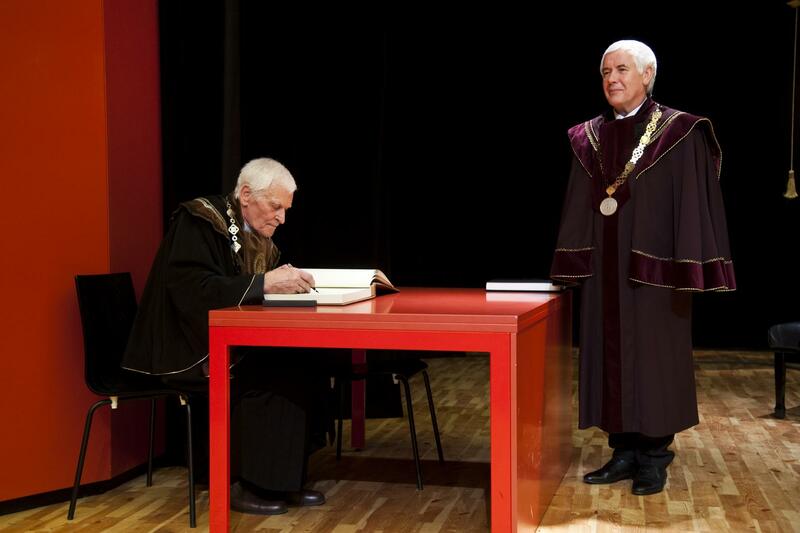 The festivities began with the award ceremony of VMU Honorary Doctorate for the poet, writer and VMU publishing house’s editor-in-chief Robertas Keturakis. 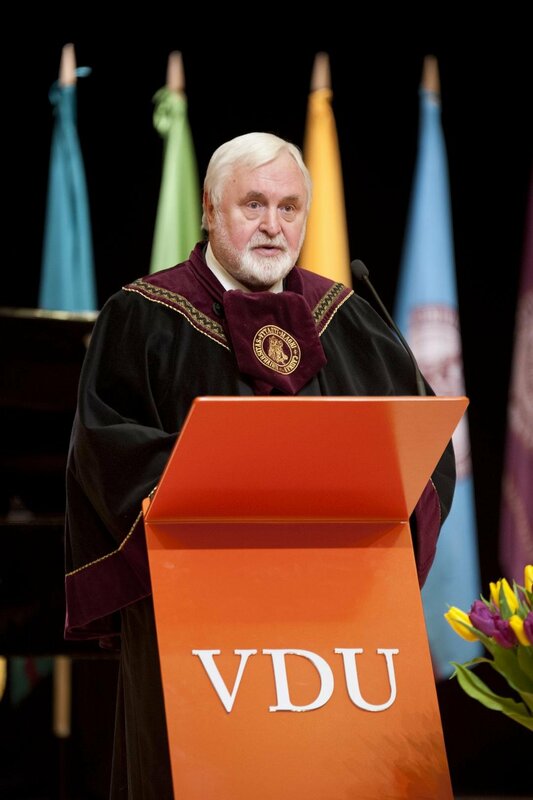 The award recipient is a distinguished author of poems, essays and other publications, editor of numerous literature periodicals, history chronicles, etc. 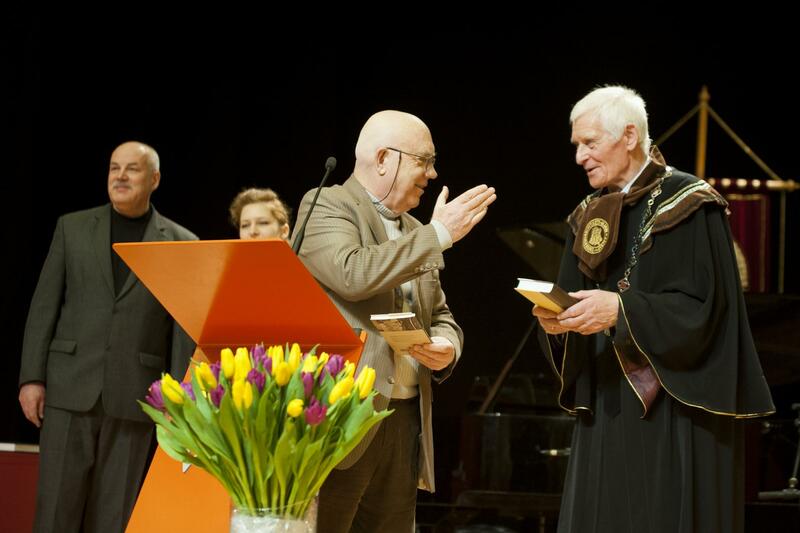 His works have been translated into Georgian, Polish, Russian, Armenian, Hungarian, Kirgiz, Latvian, Estonian, Ukrainian and, most recently, Italian. 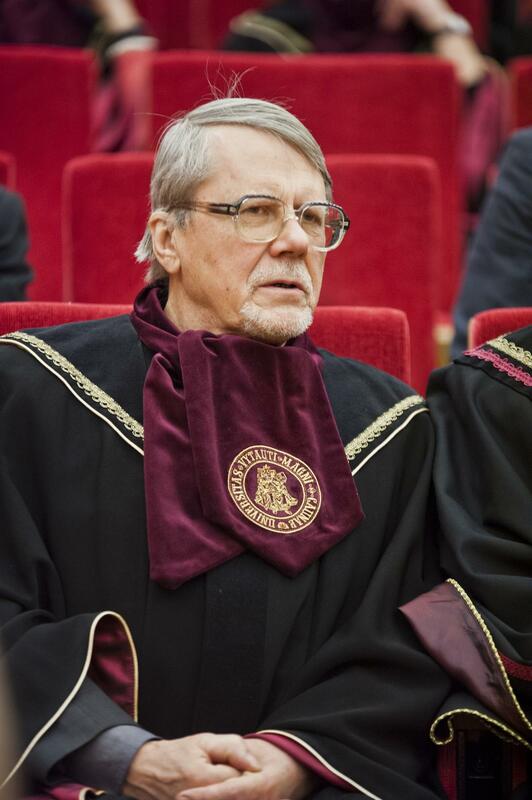 In 2012, Keturakis was awarded the Lithuanian National Prize for his achievements in culture and arts. 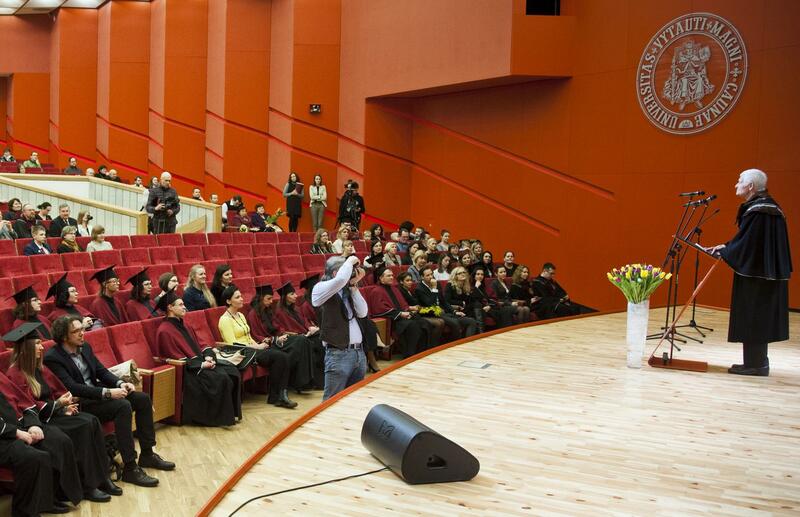 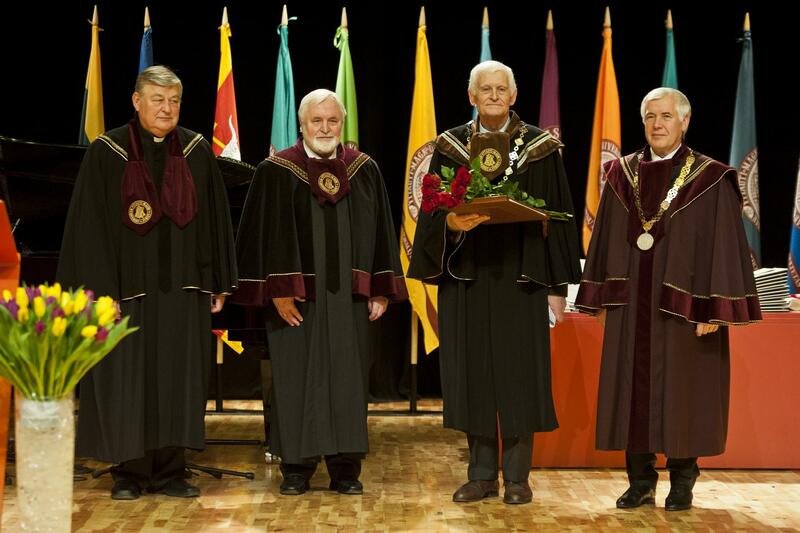 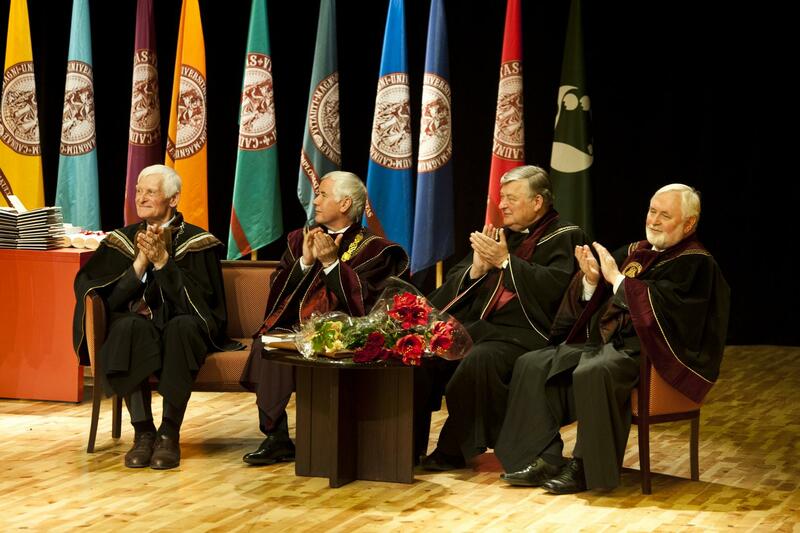 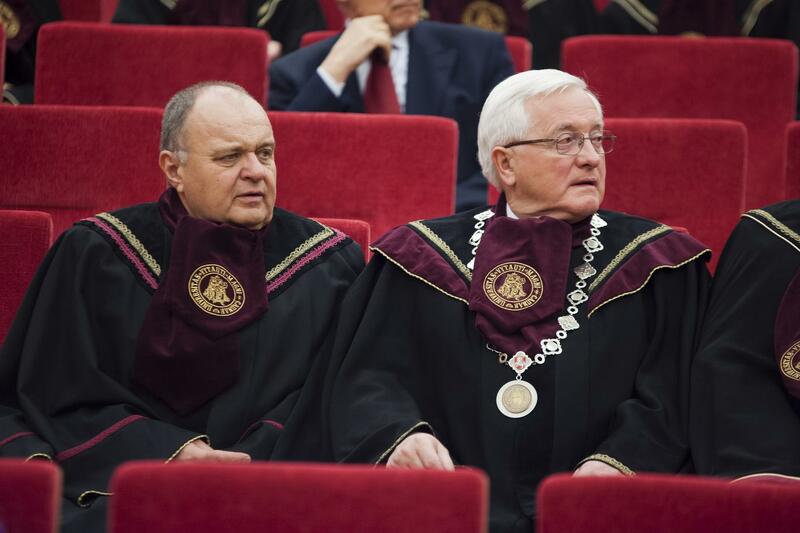 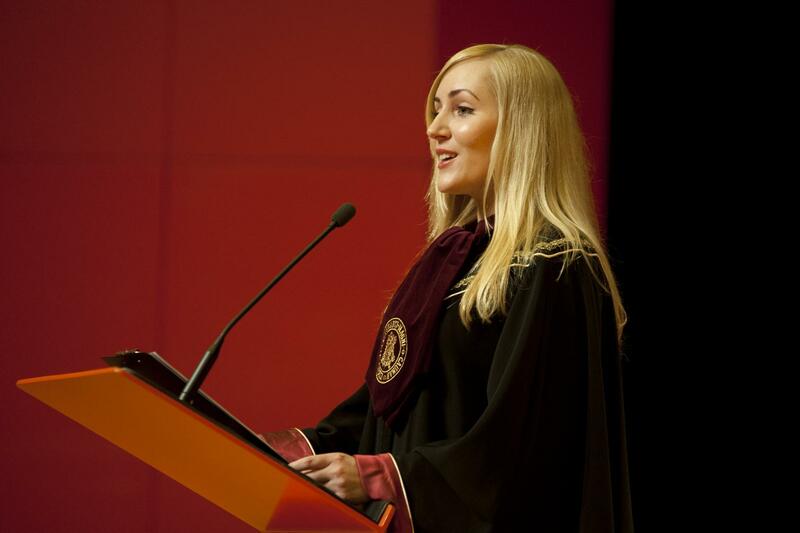 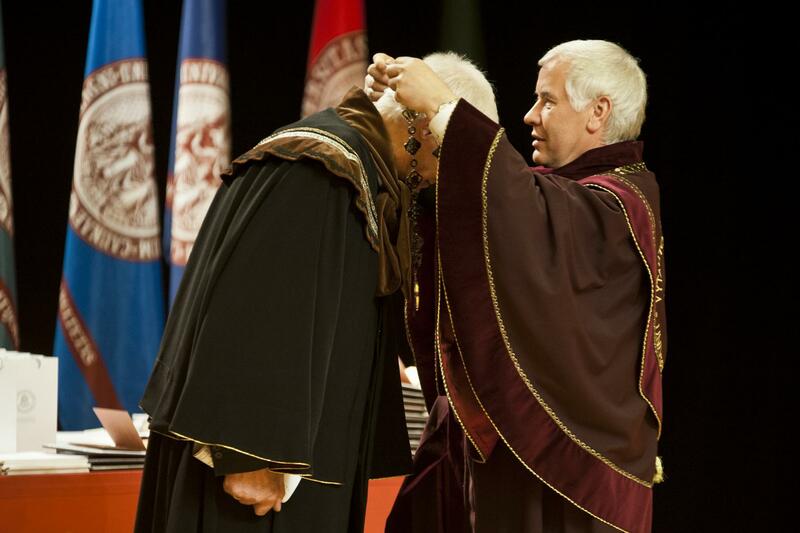 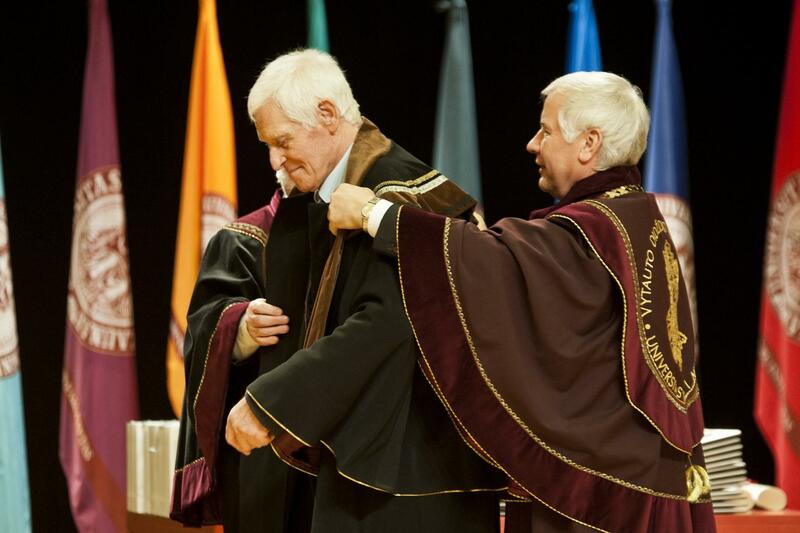 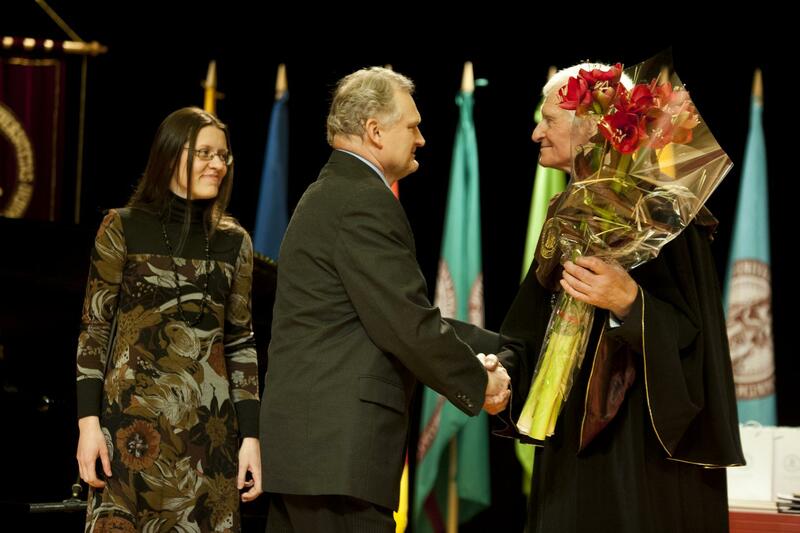 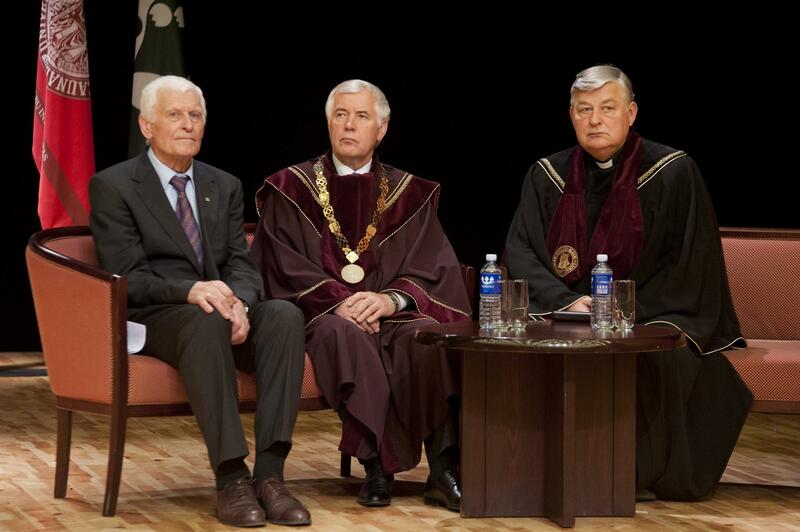 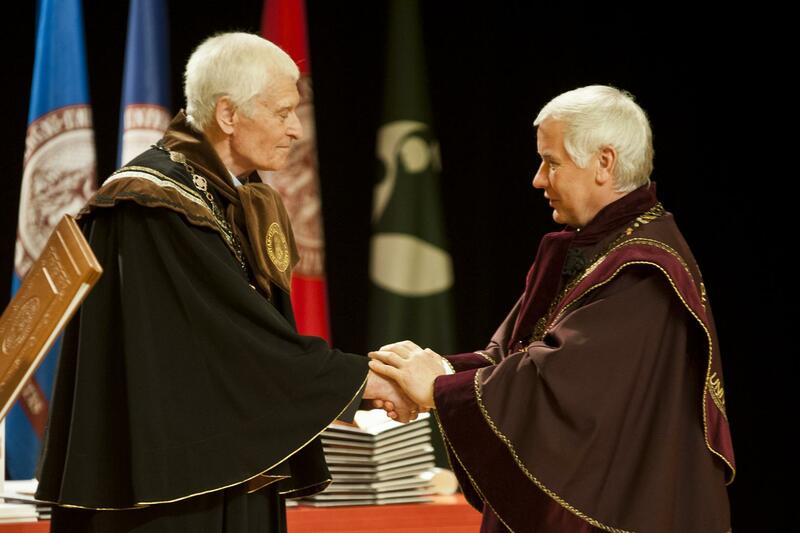 The honorary doctorate award ceremony was followed by the presentation of nominal scholarships, starting from Honorary Scholarships founded five years ago by the VMU Senate. 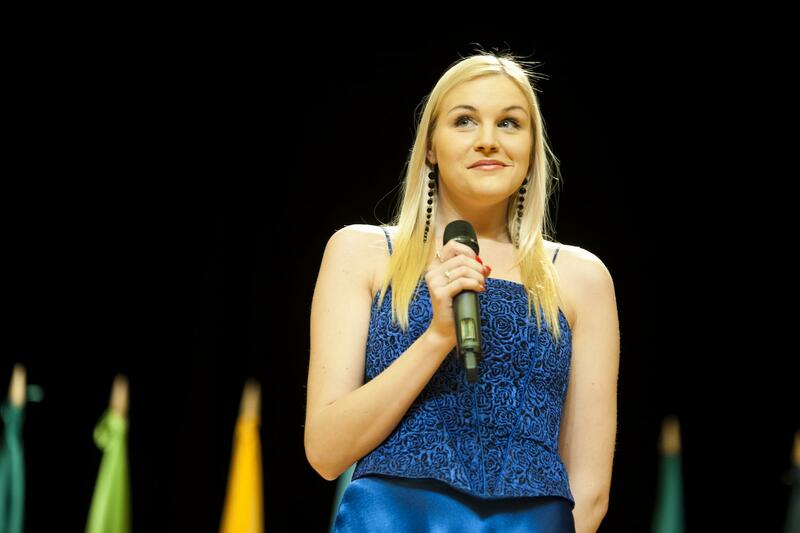 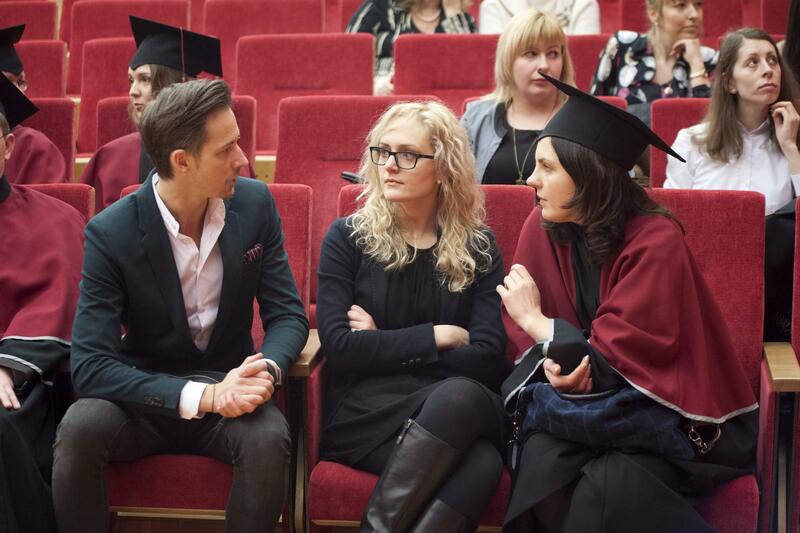 These scholarships are handed out every year to the best VMU students who have been particularly successful as university representatives in Lithuania and the world in research, arts, creativity, sports and social activities. 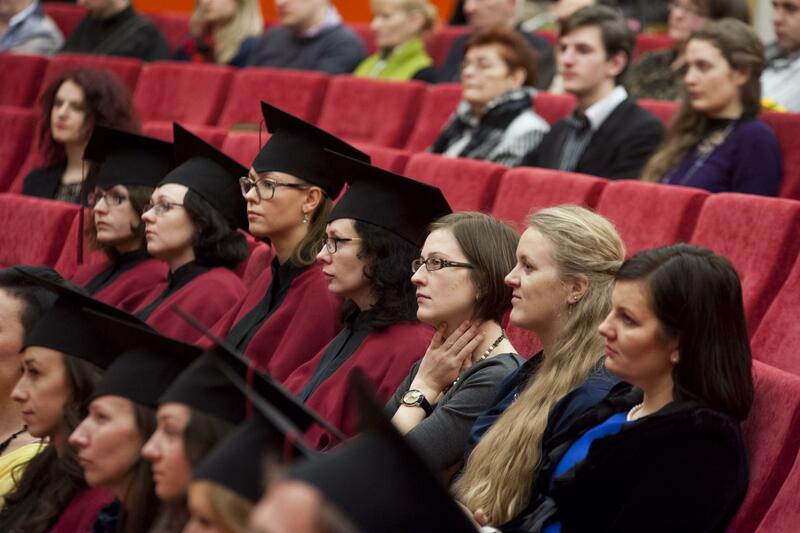 VMU alum Kęstutis Vaškelevičius, who is currently the First Secretary of EU Coordination Affairs Division at the Ministry of Foreign Affairs of Lithuania, presented the scholarship founded by the VMU graduates of political sciences. 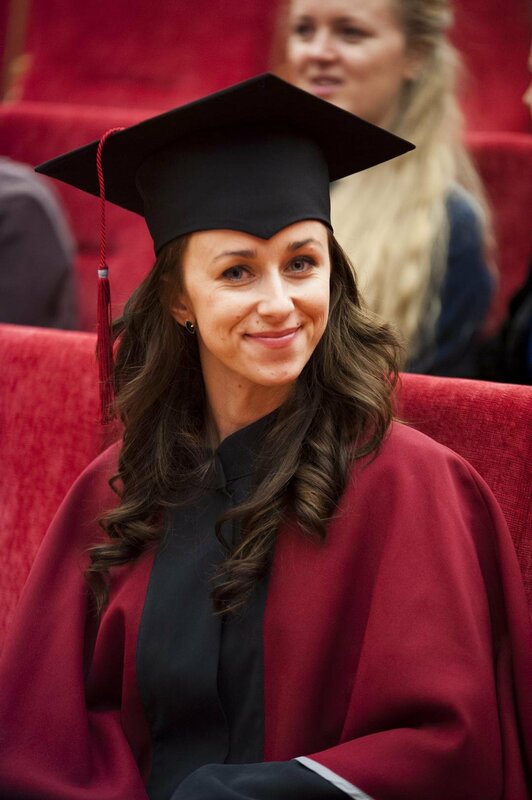 “VMU helped me and most of the scholarship’s founders to grow as personalities and became an indispensable source of support at work. 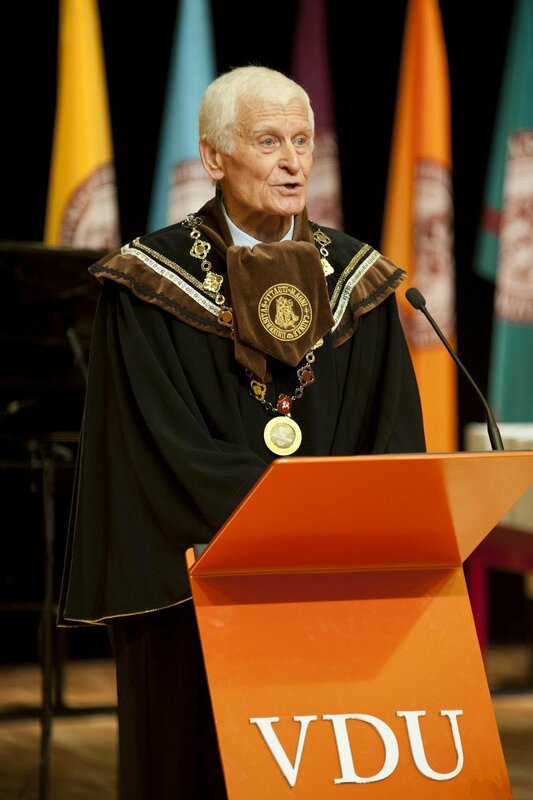 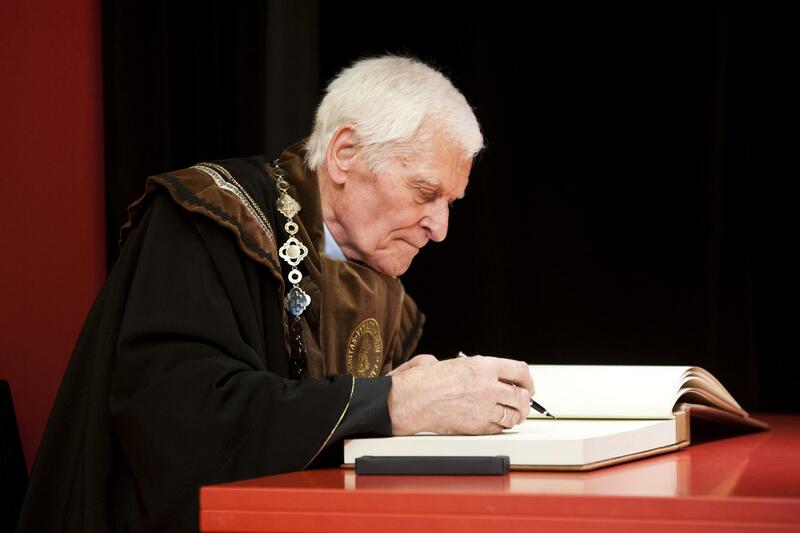 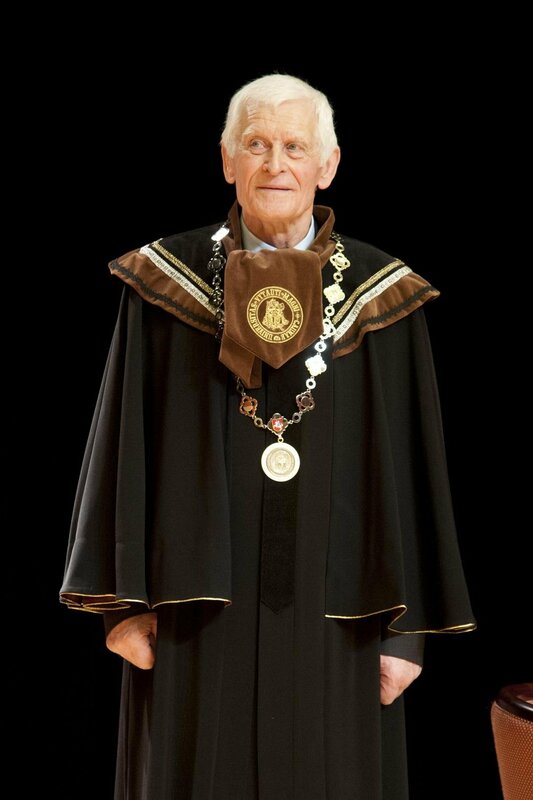 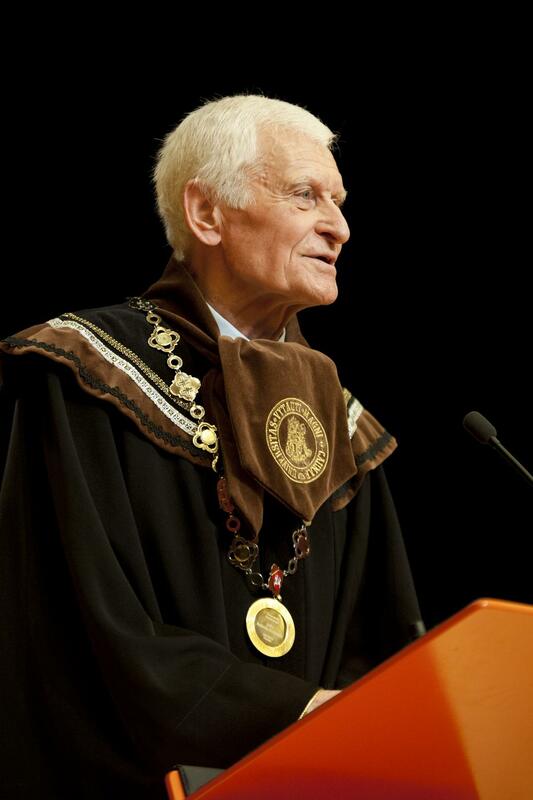 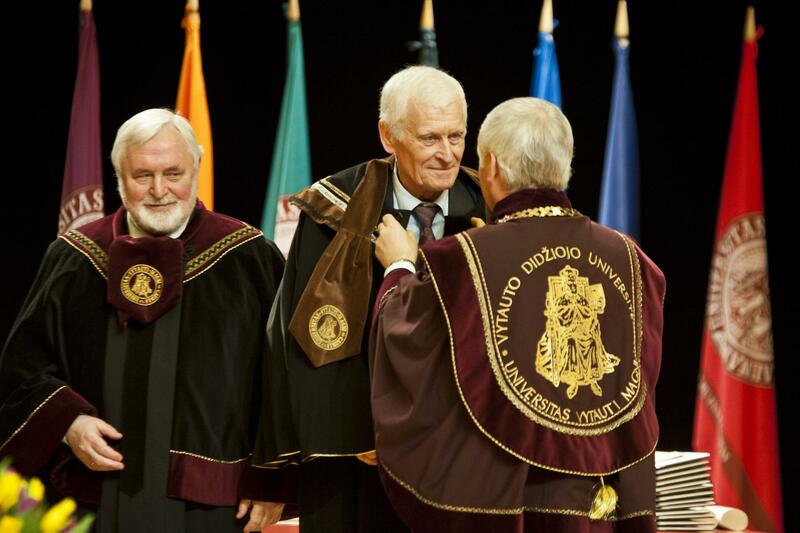 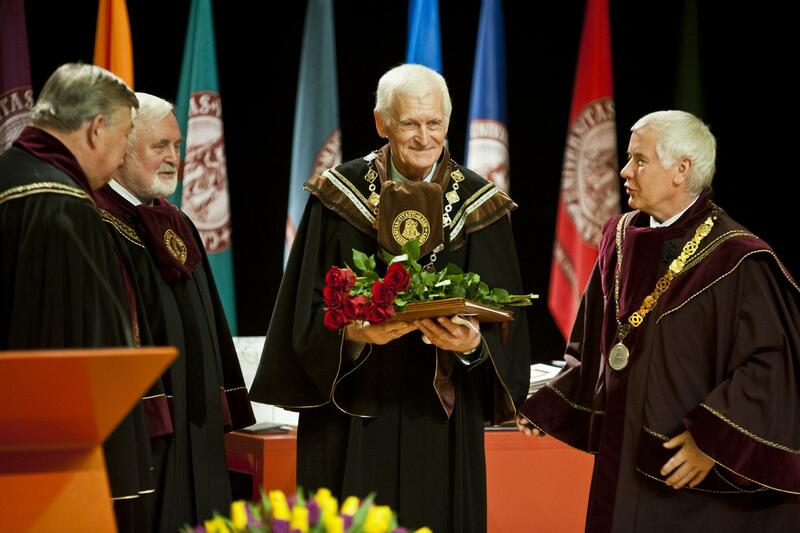 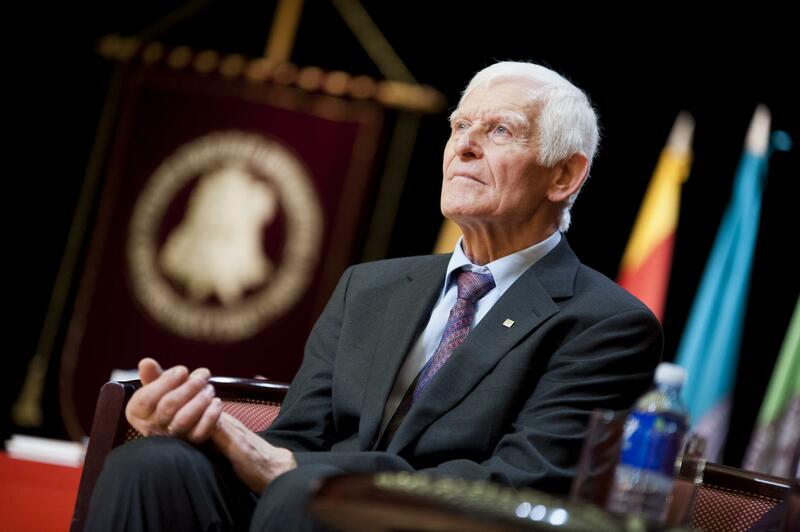 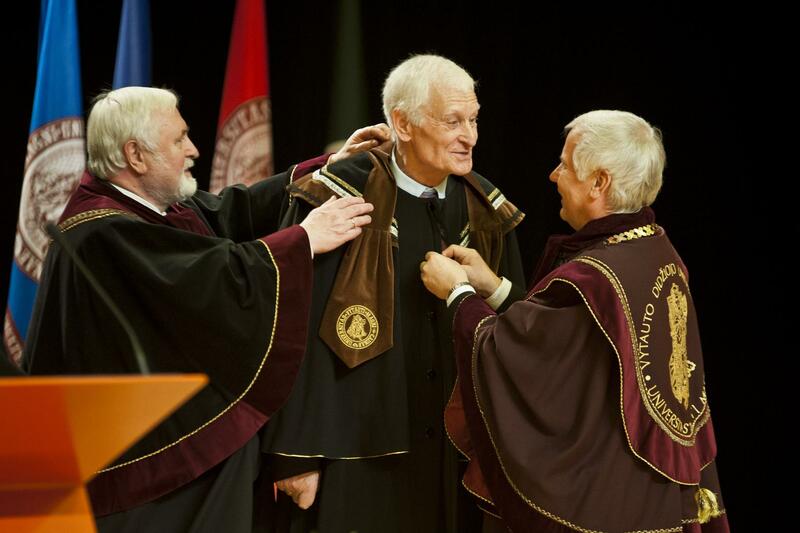 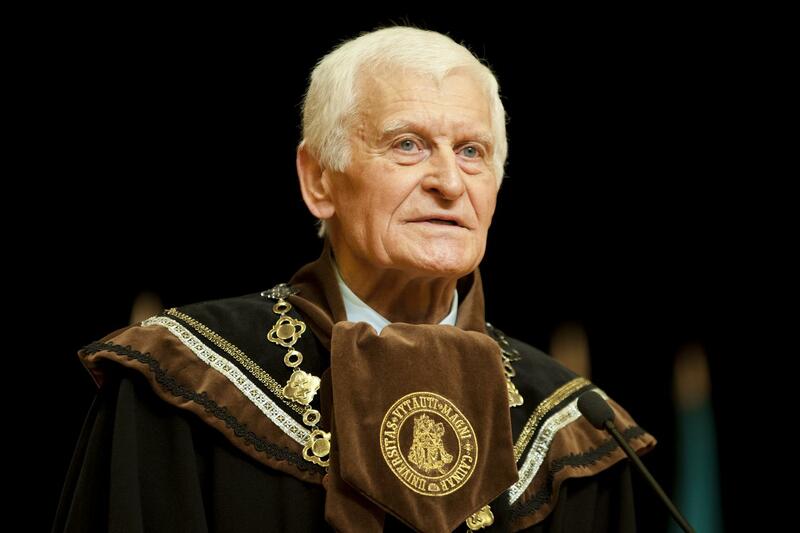 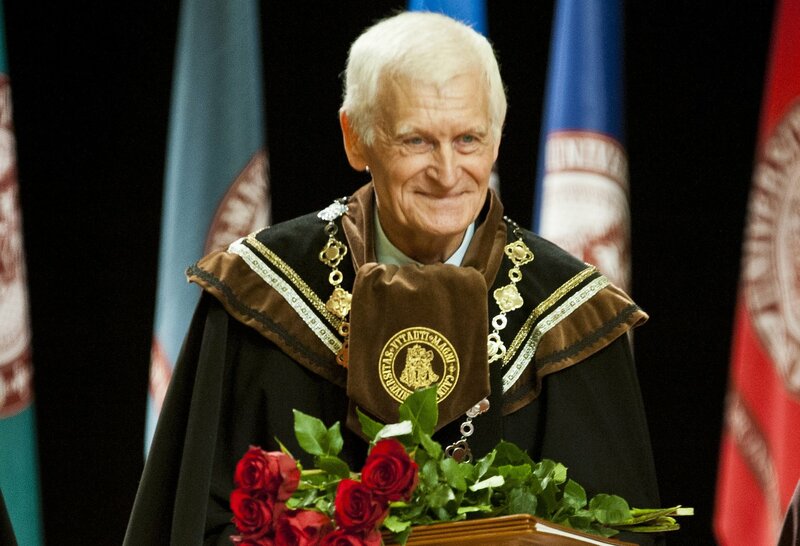 We are glad to use this scholarship as a way to return the favour, at least in part, and to encourage master students to expand their horizons and be active in social activities”, Vaškelevičius explained. 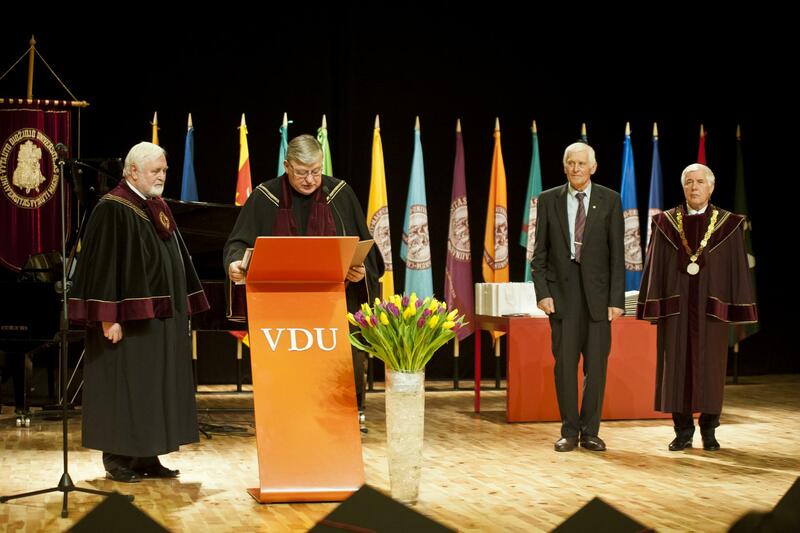 The ceremony also included presentation of the Independence Act signatory Jonas Smilgevičius Scholarships, which was awarded to the students of the VMU Faculty of Economics and Management by lawyer Jonas Kairevičius. 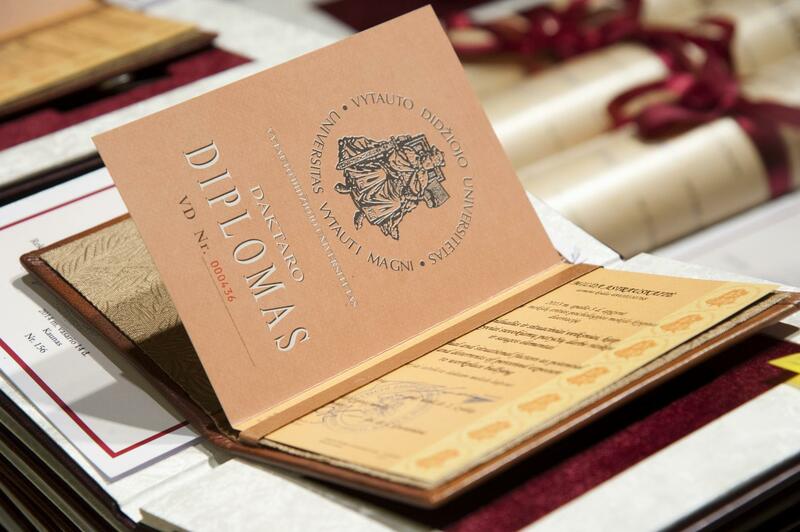 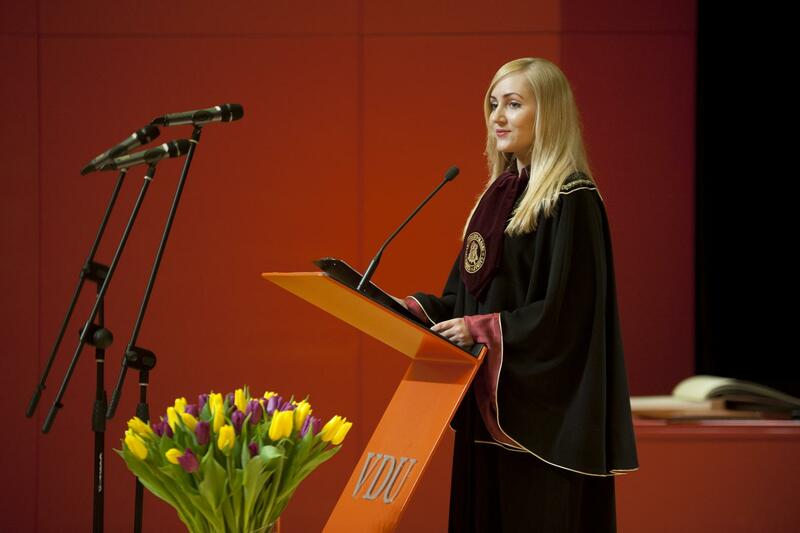 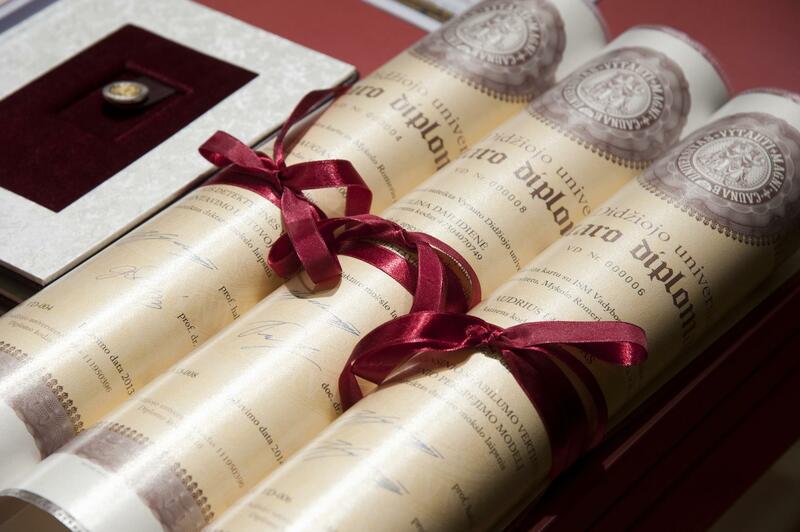 VMU doctoral diplomas and insignia were presented to the doctors who successfully defended their dissertations in the academic year 2013–2014. 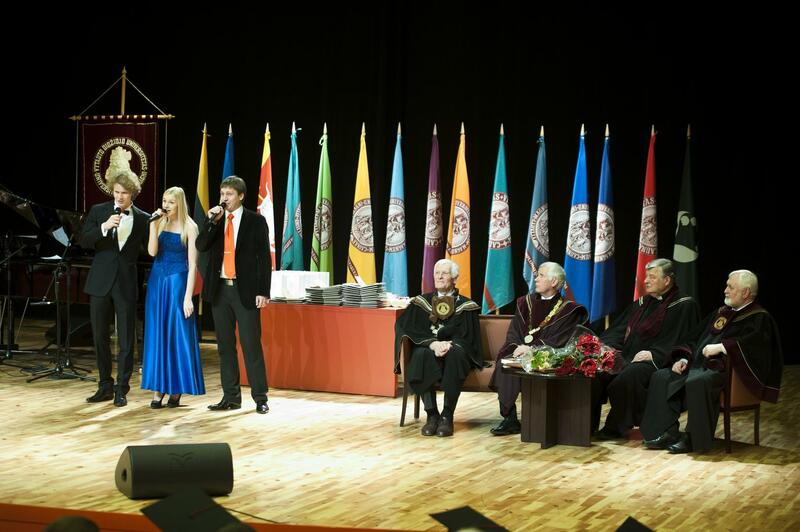 This, in turn, gave way to commendations of VMU doctors and the most active doctoral students and young researchers. 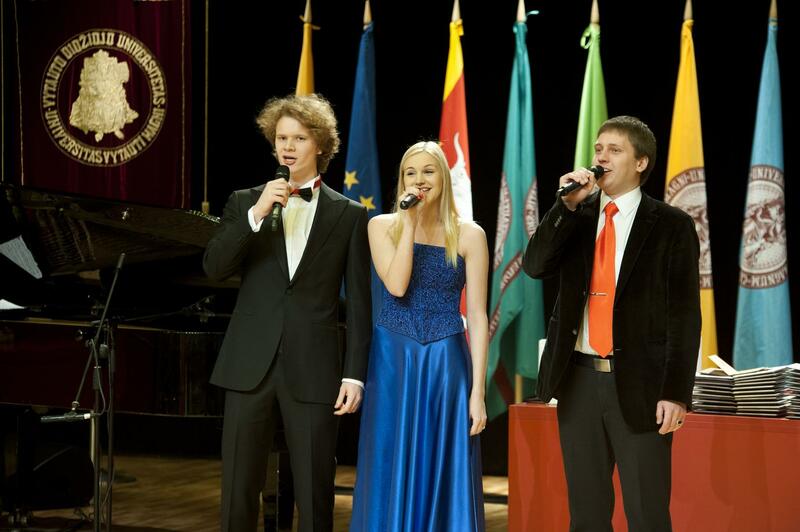 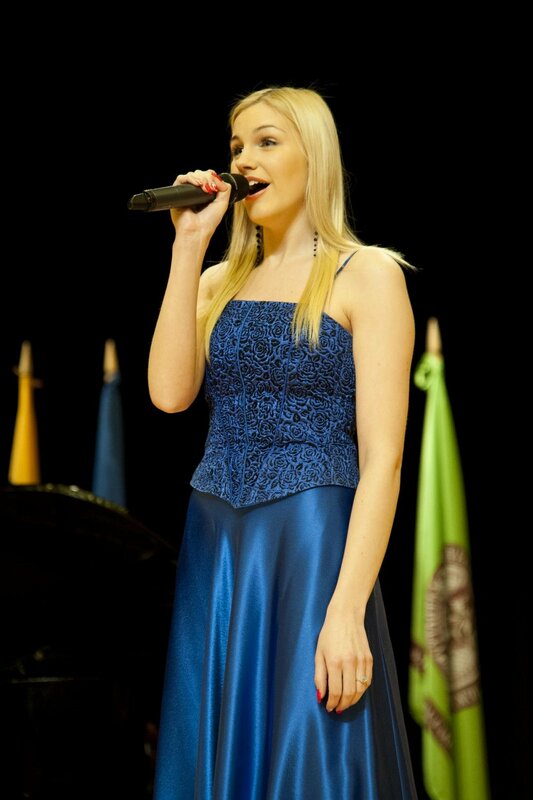 As a mainstay of most major (and many minor) university events, VMU Music Academy’s students kept everyone entertained with their performances.